The best gifts, in my opinion, are the handmade ones. I am always delighted to receive a handmade present. So much thought and love goes into making them. I would much rather have a handmade present over a store bought present any day. I'm just that type of person. This bag was made by my dear mom and gifted to me. She gave it to me in early Spring. It's been tucked away in my closet patiently waiting for the cooler days to settle in. I brought it out yesterday and wanted to share it with you. It's a granny square bag. It's lined on the inside and has lots of pockets for my phone and my keys. It was my mom that taught me how to crochet back when I was about 12 years old. I just knew the basics then. I would make a long chain and then do rows and rows of single crochet until I had a big rectangle and then I would unravel it and start all over again. It wasn't until I was older and married that I took it up again and sharpened my skills a little bit. I cherish the love and care that went into making this bag. I think I'll find a spot in the house where I can hang it and enjoy it on a daily basis. Pink is really not my color. I crochet a lot in pink because I love to make little girl stuff but actually my favorite color is red. I don't think my mom knows that and we won't tell her. It's special just the way it is. It's special simply because it came from my mom. Last night I started crocheting some boot cuffs. I plan on gifting these for Christmas. Depending on how well they turn out I might make more of them to give. I have a couple of people in mind who would love these. I also bought some more knitting needles yesterday. I've been trying to learn how to knit on youtube. So far it's not going so well but I'm not ready to give up just yet. I can cast on and can knit one row but don't know what to do after that. I seriously need a good video with a beginner project on it. Haven't found a good one yet. I'm determined to learn so I'll keep searching. Thanks for stopping by my blog. :) I love that purse! The colors look so nice together. I know what you mean about things being special since they're from Mom. I treasure everything Mom gave me, especially now that she's gone. Love your purse! I made one like that and my mom sewed the lining for me. I left it hung up for weeks just to look at. I probably won't ever carry mine either, but it's special because my mom helped me with it. I missed your dog hat post. It's adorable! So cute! I love the colors. I don't wear a lot of pink clothes but I love to accessorize with pink. Your mom did a great job with this bag. The bag your mum made is stunning, the colours are so beautiful. I like the look of your boot cuffs too, I also have a pair of these on the go! 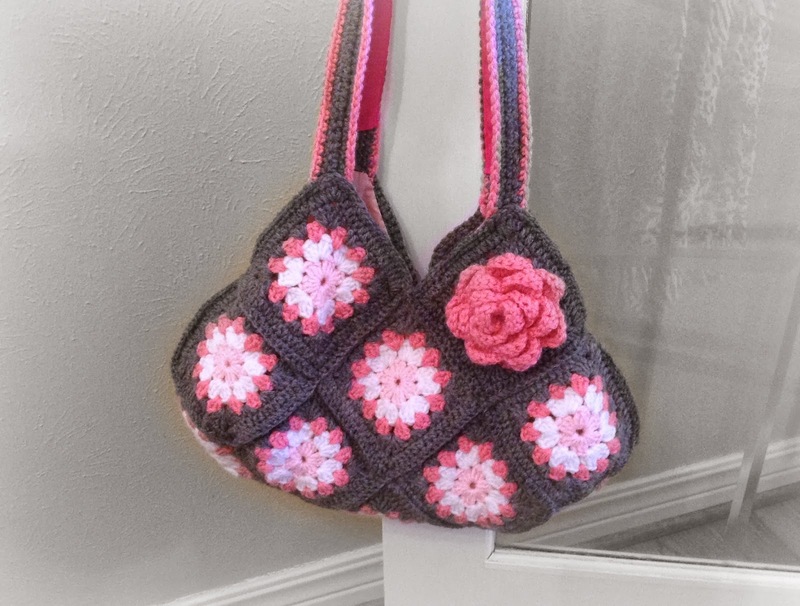 Oh that bag is beautiful, your mum is really good at crochet!! your boot cuffs are looking good! You've done a wonderful job on your bag. Good luck with your boot cuffs. I'm sure they will be lovely. Gracias ♥ y adoro este modelo es un clásico queda perfecto, me encanta bello trabajo besos.